Ethnic backgrounds, lifestyle habits, medications we take, certain illnesses we have are just some of the factors that may affect bone health. Just by being who we are could add to the causes of osteoporosis. Countless studies conclude that Caucasian and Asian women are most likely to develop this disease where African and Hispanic women are at a much lower risk. Having a small body frame and being underweight are also factors. If this condition runs in your family your chances may be higher. It may not be fair but women run a much higher risk in developing osteoporosis then men. For starters we have about 30 % less bone mass than men, that’s just the way it goes. Also the hormone estrogen, or lack of it, adds fuel to the fire. For instance if you are post menopausal, experienced early menopause (before the age of 40) or had a hysterectomy or removal of ovaries, all these factors can increase the risk of developing osteoporosis due to decreased estrogen levels. Estrogen is essential in maintaining bone density in women. 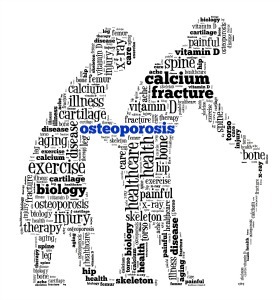 Causes of Osteoporosis linked to Ailments and Medicines. Any medical conditions which give us digestive problems put us at a greater risk to cause osteoporosis. Diseases such as Chrohn’s, Ulcerative Colitis and Celiac disease are all conditions which impair digestion, making it difficult for the body to absorb the essential nutrients that we need to keep our bones strong. Hyperthyroidism (overactive thyroid) – is a condition which leads to the over production of the thyroid hormone due to an overactive gland. This in return accelerates bone resorption (a process which by osteoclasts bread down bone). Hypothyroidism (underactive thyroid) – is a condition which needs to controlled by taking thyroid hormone medication to compensate for an underactive thyroid. Taking too much thyroid hormone medication can also accelerate bone loss. All these medications can increase in the risk of bone loss. Regardless what cards you’re dealt it is still possible to eliminate some of the causes of osteoporosis. No matter your ethnic background, body size, medical condition or prescription drugs you need to take this condition can be avoided or at least controlled by improved lifestyle and diet. There are many ways in preventing osteoporosis, but the two most popular ways are improved diet and exercise. Knowledge can be a very power tool when the right action is taken.